The Counsel of Cards | 78 little pocket-sized friends, all waiting for me to go inside & play! 78 little pocket-sized friends, all waiting for me to go inside & play! What wisdom do you have for my plans to get a job in [cross-country state] this coming school year? On the surface I viewed this as a rather negative prognosis for my chances of making this work, but the rest of the reading went quite optimistically. I think I need to analyze the phrasing of the question. I didn’t ask for my chances, I asked for wisdom. Star RV: Not listening to one’s inner voice, and allowing others to dictate your life. Four of Pentacles RV: Fretting and worrying over details. Two of Wands RV: Being ill-prepared for the task, avoiding responsibility, creative block. What can I do to change this course of events? I had interpreted the first question as an “all signs point to no” spread, hence the wording. However, I think the cards got the point. The Lovers: Partnership and attraction; high hopes and strong desires. Brighid, dearest to many heart, tell me: what are your thoughts on this matter? Page of Pentacles: A promising proposal. The Universe RV: Lost and disconnected from one’s core and spiritual center. Scattered and blocked energies. Eight of Wands RV: Cost of being unprepared, choosing to let an opportunity die, fear that something will be too difficult to handle or a price is too high. 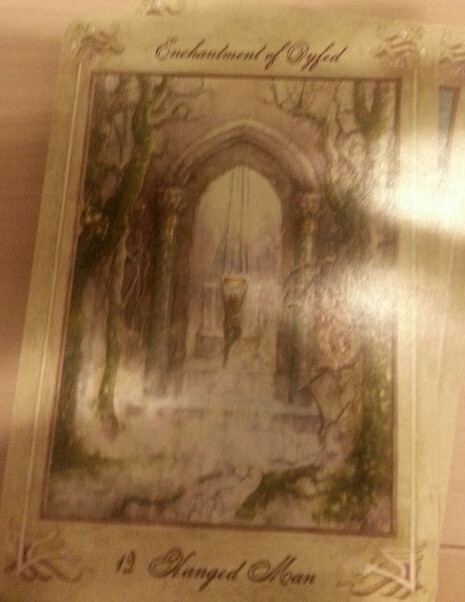 Three of Wands RV: Difficulty taking these first few steps. Need for calm discipline, research, and careful planning. Will my husband resent me for this decision? The Star: Grace and peace. Page of Cups RV: Begrudging, neglect. The Emperor: A strong leader. Conviction and self-sacrifice. Ah, the hanged man, we meet again. It is my cry for serenity. 0-The Fool: I’m taking a leap of faith, moving to a new area and finding a job after quitting my last job. My husband has just graduated from law school but is still without a job. We need health insurance, for my husband especially. I’m trying to not panic and to just go with the flow and have faith. 6-Lovers: My husband and I went through a tough few years; though the stress was not originating from our relationship, it certainly affected it. Both of us are feeling quite happy that these years are behind us. Even with an uncertain future, there has certainly been more of a glow between us: more affection, more warmth, and also a lot of time together (I’m home between teaching jobs, he’s home studying for the bar). Coming up in a few months: his family is throwing us a sort of wedding reception (because we eloped and didn’t have a formal wedding, and they want to throw a party for us to celebrate). The reception party is the first thing that popped into my head, actually. 9-The Hermit (R): I love the imagery of this card. It has all the peaceful reflective stillness of starlight, of retreating from the worries of everyday life and pondering loftier matters. That has certainly been a joy this first week since the school year ending: getting time to just sit and think, and read books on Daoism, Hinduism, and yoga (as a spiritual practice, not just the asanas most associated with yoga classes). I think the reversed is de-emphasizing it when compared to the importance of the other two, or making sure I don’t retreat too much, or making sure I am allowing myself this time without stressing too much over my life’s current uncertainties? Done today with Shadowscapes Tarot. What is my path? Where am I going? 3 of Cups: Overflowing emotions, deep bonds between friends or family. 9 of Pentacles RV: Lack of the discipline necessary to achieve what you are aiming for, choosing spontaneity over long-range goals. Overall: Socially, this move will be great, full of familial support and bonding. However, professionally there are some setbacks, possibly due to a lack of discipline and/or overconfidence. Magician: Greater opportunities for greater creative power, the ability to transform. 10 of Pentacles RV: Sacrificing financial security for a new experience. 4 of Wands: Finding structure and stability; goals and dreams becoming tangible, being actualized. Overall: Looks like a good opportunity for you personally, but takes away financial security, at least in the short term. What are my chances of getting a full time high school position, which is currently my ideal? Page of Wands: Willingness to begin something, exciting news, something real out of fiery energy. 2 of Wands: Choice between security and adventure OR sending out ships and waiting for a return. Overall: Definitely possible, but there is some risk involved. What advice do you have about this job search? 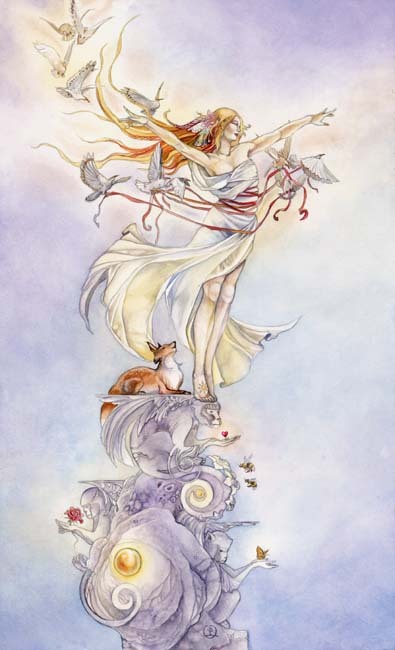 Queen of Wands: Be calm and confident, sometimes fierce. 3 of Wands RV: The end of adversity. The end of waiting? Wheel of Fortune: As the wheel turns, life changes, and something new emerges. This card’s tradition assumes increased fortune and unexpected good luck. Overall: This is probably my clearest answer today. It tells me how to conduct myself and indicates a promise of good fortune ahead. A new mother (A) has some apprehension about returning to work. She says it’s like a fresh start, but she has some concerns. Reading done the evening of Tuesday, April 26, 2011 with Shadowscapes Tarot. 1. Stepping out into the crisp Autumn air, you go for a walk in the woods. This is where you are starting from. 2. As you walk down this path, you hear a twig cracking in the brush. These are the fears you will encounter. 3. So you wrap your shawl tightly around you, and grasp it tightly as you quicken your pace. This is that which you will find comfort in. 4. Off in the distance you see a deer with it’s fawn crossing appearing in your path. This is what you don’t expect. 5. A wise owl swoops above your head and lands on a far up branch. This is what you will learn along this path. 6. As you reach the end of your journey, you ponder all that has happened and what has resulted. This is the outcome of your journey. The querent asked me to do a reading about being a new mother, as she just had a baby. We decided on a simple three-card spread: Situation, What to Do, and What Not to Do. Reading done the evening of Tuesday, April 26, 2011 with Shadowscapes Tarot. The querent asked me to do a Tarot reading for her newborn baby, who I will refer to as Little Miss J in this entry. I found this spread through a Google search and adapted the shape of it just a bit to what made the most sense to me. Reading done the morning of Tuesday, April 26, 2011 with Shadowscapes Tarot. The parents’ gifts to the child surround her spread (cards 1 and 2). She also receives a main source of support from the world around her (card 3), and will be aided by her own best strength (card 4). She will need to overcome her biggest challenge (5) in order to fulfill her life’s purpose. The rock cuts into my bare feet, fragile. A thing that, when I see, will make me smile. And that much further I’ll be from the sky. But what will happen when I leap in faith? And curse me to a never-ending brawl? So powerfully I hear the call to fly.